Two suspects with prior criminal records were arraigned on several felony charges Monday afternoon related to a drive by shooting near Howard City over the weekend. According to the Michigan State Police Lakeview Post, they were called to the scene on Howard City/Edmore Rd in Reynolds Township about 3:50 a.m. Sunday morning, August 6. While police were there, the victim, a 37-year-old Howard City resident, was receiving text messages from the suspect. They determined the suspect was at a gas station in Howard City. 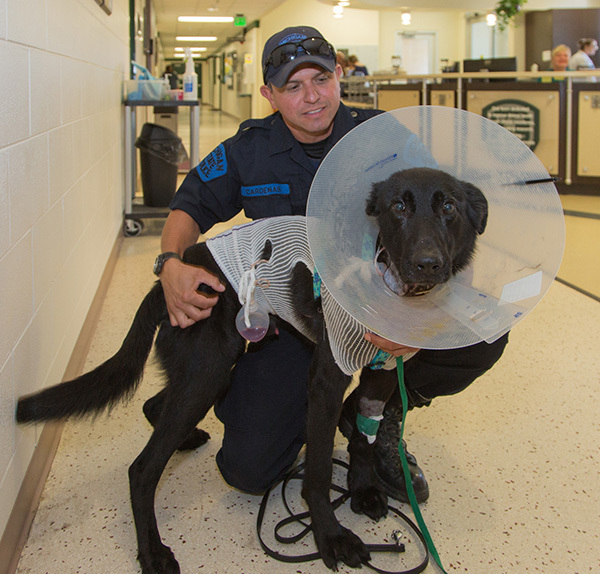 Bolt, the MSP K9 that was injured by a suspect early Sunday, was treated at the MSU Veterinary Hospital. He is shown here with his handler, Trooper Cardenas. Troopers located the vehicle and attempted a traffic stop, but the suspect fled. The pursuit ended a few miles away behind a residence, where two suspects fled into a wooded area. 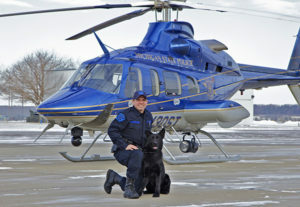 A Michigan State Police K9 was brought in and tracked down the suspects. 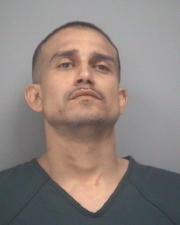 One of the suspects injured the K9 when he attempted to stab the dog with a pocketknife. The suspect was then tased by police and taken into custody. According to Lt. Rob Davis, police believe the shooting was over a financial dispute. Troopers recovered what they believe is the original firearm used in the shooting. The serial number had been removed. The two suspects, Jose Antonio Perez, 33, of Grand Rapids, and Victoria Jean Groth, 29, of Grand Rapids, were arraigned Monday afternoon in front of Magistrate Eggleston in Montcalm County’s 64B District Court. Perez was arraigned on eight counts: Serious injury to a police animal, a five-year felony; weapon, felon in possession; ammunition, felon in possession; carrying a concealed weapon; felonious assault; fleeing and eluding, 4th degree; resisting and obstructing; and felony firearm. Bond was set at $250,000 cash/surety. He previously served time for home invasion, safe breaking, and possessing a weapon while a prisoner. He was paroled in 2015. 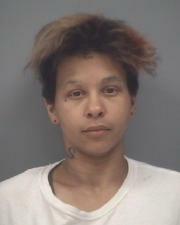 Groth was arraigned on felony probation, detainer, Kent County; and two counts of resisting and obstructing. Her bond was set at $40,000 cash/surety. She was on probation for one count of larceny in a building, and one count of uttering and publishing. 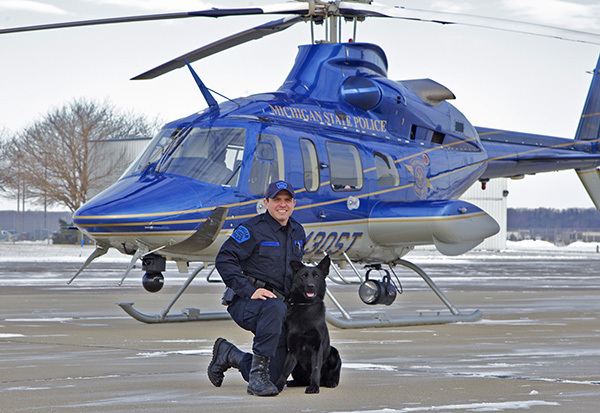 Bolt, the MSP K9 that was injured, was taken to the MSU Veterinary Hospital, where he was treated. Police initially thought he only suffered a minor cut, but once at MSU, it was discovered his injury was more serious. Bolt was released from the MSU Veterinary Hospital Tuesday, and returned home with his handler, Trooper Cardenas, to continue his recovery. It will still be a couple of weeks before he is ready for duty.